The bright jacket of this book caught our attention right away, but we were even more excited when we saw what was inside. Author Dianne Zweig takes us on a nostalgic journey to the more vibrant and colorful kitchens of the 1930's, 40's and 50's. 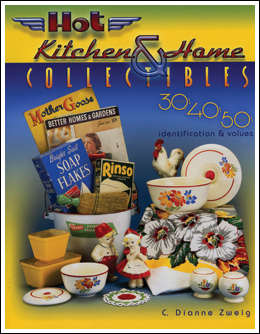 Filled with over 700 full color photos and illustrations, this great resource will take you through your favorite kitchen and home collectibles, including pottery, textiles, laundry aids, bath essentials, recipe and appliance booklets, ads and nursery items. This will become your new antique mall, flea market and garage sale companion. 304 pages, TP, 11" X 8-1/2".